Birmingham have qualified for the Elite League play-offs, despite a second home defeat in three nights at Perry Barr. Monday's 47-43 home defeat by Poole left them knowing they could lose their final home league fixture by up to 12 points and still qualify for the top four for the first time. But that was never in doubt as they led Swindon for most of the evening before eventually going down 46-44. The Brummies now meet Swindon again when the play-offs start on Monday. Birmingham may have to build a big first-leg lead to take to Swindon on Monday week (1 October). After the Brummies had dominated, second-placed Swindon launched a comeback to move level in heat 12 before condemning the Perry Barr men to defeat in front of their home fans with a 5-1 in Heat 15. Reserves Martin Smolinski and Nicolas Covatti made good contributions, as did Sebastian Ulamek, Brummie's top scorer on the night with 10, and Josh Auty. Ben Barker and Danny King both faded in the latter stages - and, with number one, Bjarne Pedersen out of form they just fell short. After finishing the regular 28-match season with narrow home defeats against the top two, Brummies boss Phil Morris sees the play-offs as a fresh start. "I probably have the same emotions as I did against Poole on Monday," said Morris. "We did well but not well enough and they came back at the end. "The positive is that we are in the play-offs now. Forget everything that has gone on, we now have two massive meetings to concentrate on." Coventry maintained their fine end-of-season form as they cruised to a 52-40 Elite League win which finally ended Peterborough's play-off hopes. Following on from Monday night's 45-45 draw at King's Lynn, the Bees made a blistering start to go 18-6 up after four races and were never caught. Mechanical failures for Aaron Summers in Heat 10 and then Chris Harris in Heat 13 brought the Panthers back within range, especially as Scott Nicholls dropped his only point of the night to Mads Korneliussen in a tight finish. But Kenni Larsen's strong outside run in Heat 14 ended the Panthers' interest before he and Nicholls applied the finishing touch with a final-heat 5-1. "It was a perfect performance," said Bees boss Blayne Scroggins. "We knew the team was capable of this and it's a good end to our Elite League campaign at home. "We want as good a place as we can get in the league and to keep the momentum going for the Knockout Cup. It would be nice to get into the Final and pick up some silverware." 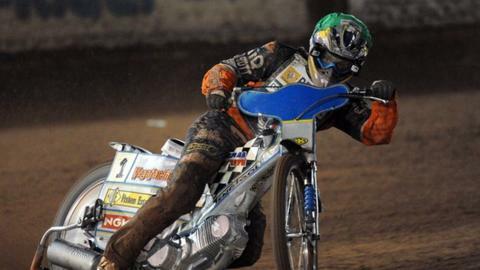 Danish rider Nicolai Klindt says that Wolves' chances of making the Elite League play-offs were scuppered by injuries. "It has been disappointing for Wolves but we can't help it," he said. "Me and Tai Woffinden were injured for a long time otherwise we'd have been pushing hard for the play-offs. "Tai has done well since he has come back but it's down to some bad luck for us. "I was going into a really good run when I got injured and with me and Woffy out it was very tough. "I have struggled since coming back and it just hasn't been our season. Lots of things have gone against us." Table-topping Dudley Heathens have chosen Stoke Potters as their semi-final opponents in the National League play-offs. The first leg has been set for Monmore Green next Tuesday with the return at Loomer Road a week later, which will ensure both sides can field their strongest-possible line-ups. Heathens chairman Nigel Pearson said: "Once we made the decision to select Stoke as our opposition we started talking to Dave Tattum about potential dates. "We went there in July to fill a gap in their fixture schedule and, in return, it was agreed that any play-off clash would be staged on nights where there are no clashes with Premier League fixtures." Dudley's choice means the second semi-final will be between Mildenhall and the Isle of Wight, who booked their place with a 50-40 win at King's Lynn on Wednesday. Stoke lost their National League Knockout Cup semi-final clash with Mildenhall, who will meet Dudley Heathens in the final. Carrying a 16-point lead from the first leg, the Fen Tigers won 50-44 at Loomer Road, with in-form Stefan Nielsen piling up 17-points, being beaten only in the last race of the night.